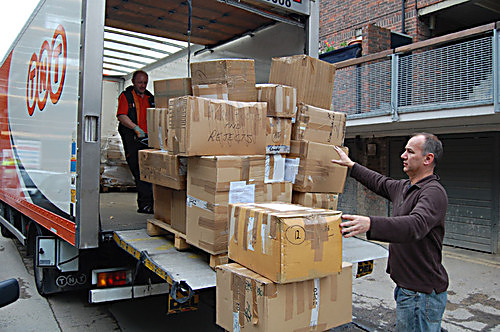 Picture caption: Rob Miller, Music Fund Director loads the boxes of ballet shoes and instruments ready to send to the airport. The latest consignment of ballet shoes and instruments was sent to Cuba at the beginning of April 2008. 600 pairs of ballet shoes and a selection of brass and string instruments donated by Music Fund supporters will be used by budding dancers and musicians in Cuba. The shoes will be sent to the Ballet Cía of Santiago de Cuba that “has serious necessities not only of shoes but also of some other ballet clothes and appliances” according to the Music Fund’s partners in Cuba.